Comment: What a great picture by one of the very best painters of the great illustrators with a heyday from the 1930's through the 1950's. This has been on consignment for a while and it's only been very recently that I've pieced together its life story. When my former employer, Illustration House, sold this in 1995, it was on consignment from Charles Martignette, the legendary collector. I'd previously thought it came from Anderson himself, but I was (gulp) wrong. Martignette most likely acquired it from Anderson as Charles was very good at wooing old-timers (artists and collectors) and prying treasures away from them. My consignor purchased it at the IH 1995 auction. After a little while on my website, I consigned it to a major Illustration auction where it, unfortunately, did not sell. After the auction, someone approached them and made an offer. After a lot of back and forth with the owner, the offer was accepted. Then the person who made the offer to the auction house never paid. Grrrr. I'm pretty sure that I know who it was and have since dropped them from my mailing list. You know who you are and the rest of my readers don't need to. 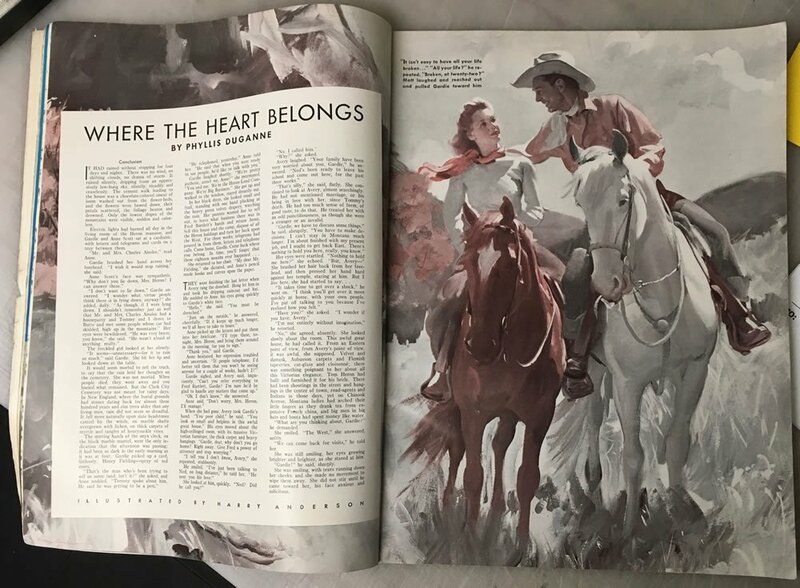 When it came back here after that part of the adventure, I (as is my nature) wanted to find the accompanying magazine, but the story title that appeared on the back was incorrect and it took quite a bit of digging around to locate and acquire the magazine. 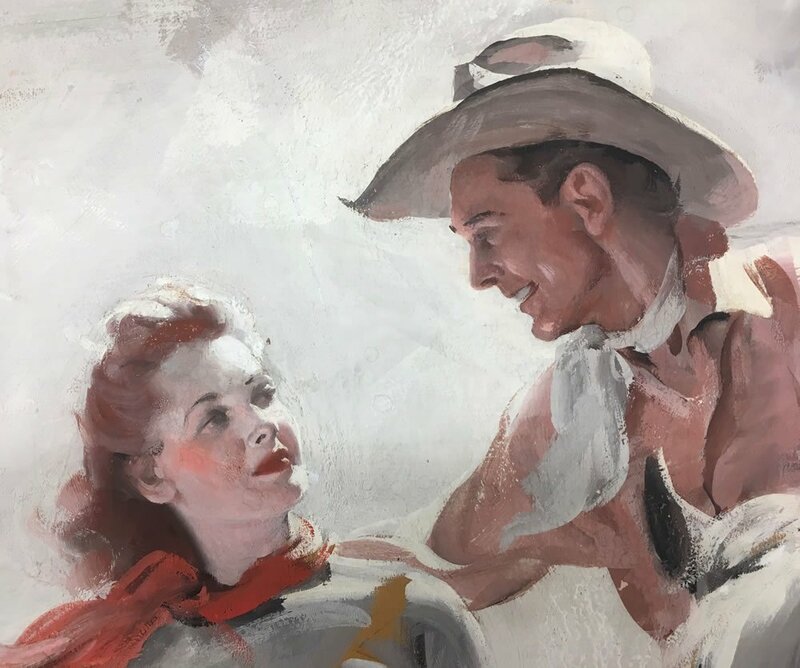 This all was complicated by the fact that I'd have sworn that the people depicted were Roy Rogers and Dale Evans… turns out they are not. A friend pointed out from the very beginning that the horses were incorrect… “not Trigger or Buttermilk” she said. I was thrilled to acquire the magazine. 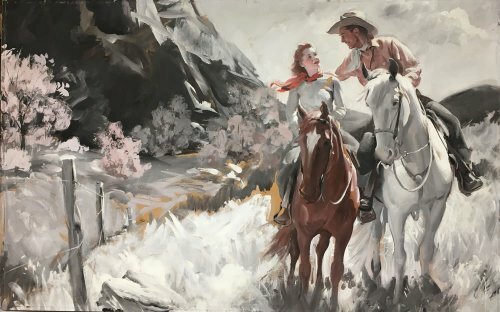 The only downside to that was that while I'd long thought it was unsigned, turns out that it is signed and dated in the lower left, but the board has been cut down slightly to refit it into a frame that appears to have originally been on a Pruett Carter painting. This has left only the top 2/3s of the signature extant and at that covered by the frame. I displayed it for a time at the local antique mall where my wife has a booth… a lot of people loved it there, but no one was quite ready to pull the trigger. Sorry. There's the story to date. This deserves to have the little bits of inpainting done and to be in a new and appropriate frame behind glass. Includes a copy of the magazine. Price: PRICE TO FOLLOW PENDING RESTORATION AND REFRAMING. 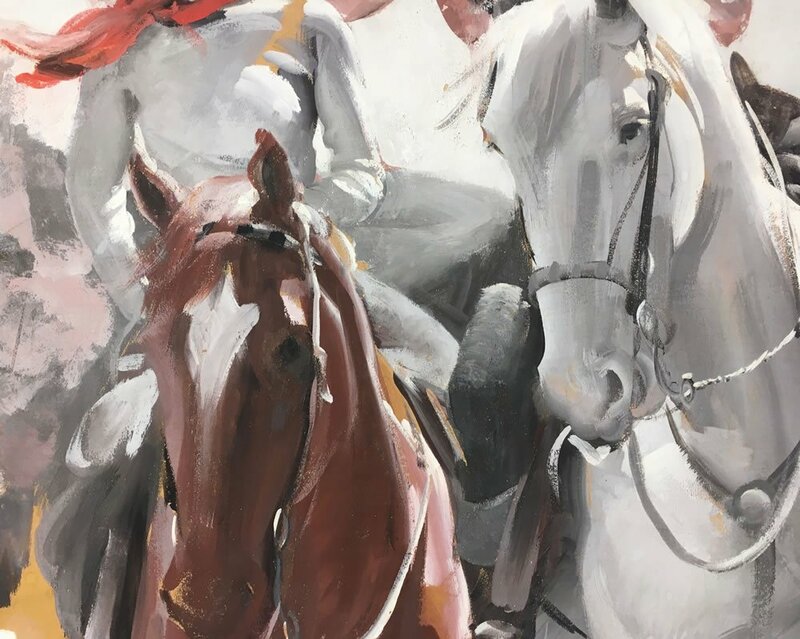 Condition	 Browned areas of board, some areas of paint loss, particularly to the ears of the horses and to the woman's scarf. In a frame that's not doing the artwork any favors. Signature	 Signature in lower left, trimmed and obscured by frame.